This is a plaster model for a two-sided relief intended as a garden ornament. The artist, Gilbert Bayes, described the group as ‘something between a relief and the round: perhaps a two-sided pierced relief’. While its subject matter derives from Greek myth, the stylised treatment of the reeds and water recalls ancient Egyptian art. 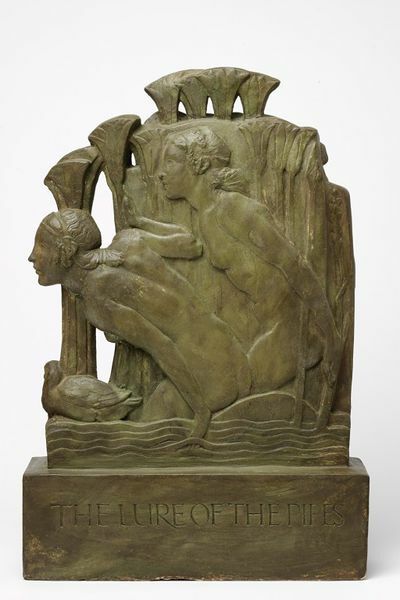 The relief has an Art Deco feel and represents a strand of early 20th-century British sculpture that ran parallel with Modernist style works by Henry Moore and Barbara Hepworth. The original much larger version is currently on loan to the Henry Moore Institute, Leeds. It was produced in cement, one of the new and unusual materials that appealed to Bayes. 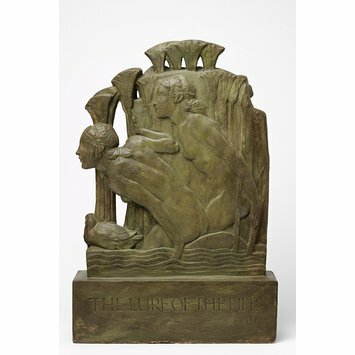 A bronze version is also in the V&A (Museum no. A.3-2004). Plaster two sided relief depicting two water nymphs and a duck, a figure of Pan on the other side, painted to resemble bronze. Given by the Gilbert Bayes Charitable Trust 2004.